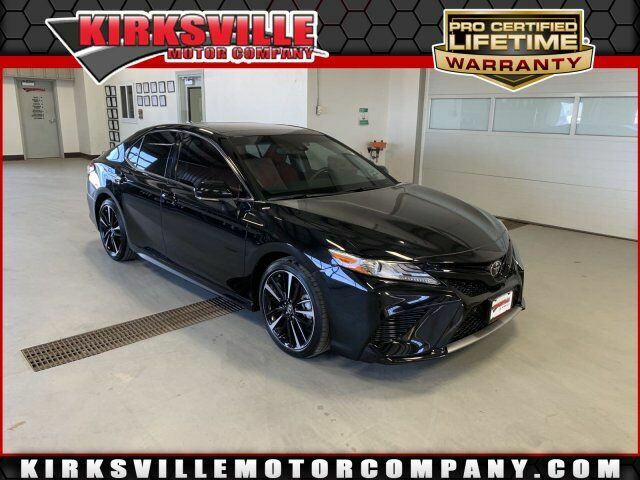 Find out why everyone is talking about this widely acclaimed 2018 Toyota Camry XSE. AUDIO PACKAGE, ALL WEATHER FLOOR LINERS & CARGO TRAY PACKAGE, ACCESSORY APPEARANCE PACKAGE , PANORAMIC ROOF, Window Grid Antenna, Wheels: 8.0J x 19" Black Machined-Finish Alloy, Variable intermittent wipers, Valet Function, Trunk Rear Cargo Access, Trip Computer. At Kirksville Motor Company get peace of mind when you purchase a new or qualifying used vehicle! With our "Buy Back Guarantee", you have 5-days/500 miles to return or exchange it, no questions asked. Purchase select used vehicles and you get 5-days/500 miles to return it or 30-days/1500 miles to exchange it. Now what other dealership do you know offers this kind of peace of mind?